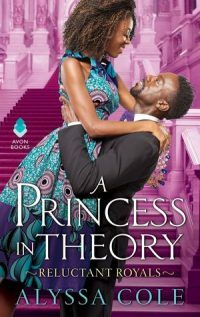 This is book one in the Reluctant Royals series, and it features Naledi Smith and Prince Thabiso of Thesolo. Unbeknownst to her, former foster kid Naledi was once betrothed to Prince Thabiso. But, as an orphan with no recollection of her parents or hometown, when she starts receiving emails from Likotsi, assistant to His Royal Highness, she assumes she has been targeted by scammers. After receiving an unfavorable email response from Naledi, Thabiso intends to confront Naledi and demand an explanation for her parents’ insolence in leaving the kingdom of Thesolo. When Thabiso realizes that Naledi has no idea who he is or who she really is, he decides to shrug off his royal duties in exchange for the opportunity to be a commoner. What follows is a romantic and passionate courtship that reads like a Disney fairytale, with a touch of humor. Find it in the catalog.